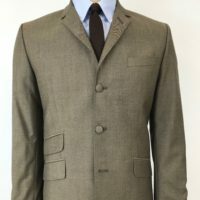 Jump the Gun wool mohair tonic suit. 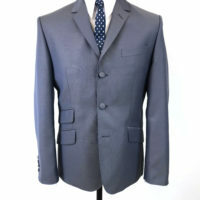 Our suits are based on an early to mid 60s fit. They are very fitted with a trouser that tapers to 15.5 inch bottom. The Jackets are cut quite short (not quite a bum freezer) in the body. 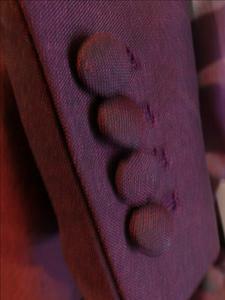 They all have covered buttons and the lining is contrasting at the inside pocket openings of which there are three. 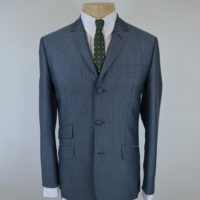 We would like to think that there is no one making an of the peg suit in this particular style as good as this anywhere. Please call or email us if unsure to discuss sizing as these do not fit like regular suits. Burgundy JTG Tonic, do not have the privelidge of owning one yet.But would just like to say.Thank god for some proper english made clobber like this!.I’ma skinhead in Australia,and lets face it, unless I travel to somewhere like Carnaby st, I will not find a tonic suit this beautiful and of such high quality.And most of all these garments are made with love i think.I want to get married in a tonic suit,and it looks like JTG are going to be the ones to kit me up for it.Lovely gear people.Keep up the good work!